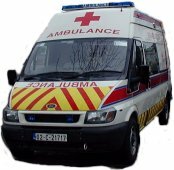 First Aid Cover: Volunteer members from the Dublin 15 Unit will be present at your event, with highly equipped response bags and other equipment that will enable them to deal with almost all life-threatening situations that could arise. The Dublin 15 branch has a fully equipped ambulance including an Automatic External Defibrillator. It is envisaged that a new ambulance will be purchased within the coming months. First Aid Training: There are several courses available that teach you life saving skills enabling you to remain calm and treat people when accidents happen. It is usually taught to groups of up to ten people. We can organise a venue or attend one that is convent to you. Click here to get more information on the Different Courses Available. Babysitting Course: Teenagers aged 14 and upwards can be trained in best practice techniques in all areas of babysitting based on a comprehensive course. The training includes What makes a good baby-sitter; The roles, rights and responsibilities of baby-sitters; child care skills; accident prevention and fire safety; child First Aid; CPR; and child protection. To get information on any of the above courses or any other course you would like Click here.